Each year more than 100,000 people are hospitalized due to complications from the flu virus. I’m sure we’re all familiar with the symptoms: fever, sore throat, congestion, fatigue, muscle and body aches, runny nose, dry cough, sneezing and watery eyes. 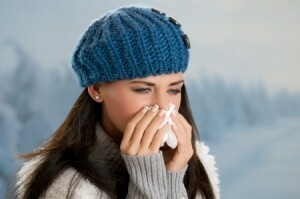 Colds are much less severe than the flu — however, like the flu they are caused by a virus. And though symptoms are less severe, the nasal congestion, sneezing, coughing, sore throat and headaches can be more than annoying. Though it may make you feel lousy getting a cold is not always a bad thing. In fact, it’s a sign that the body’s resources are strong and vital, working to return you to a state of good health. However, if your immune system is already compromised, a cold could further weaken your body leaving you open to a more serious illness. Even though germs, bacteria, and viruses are everywhere — in the food we eat, the air we breathe, and the water we drink — according to Chinese medical theory, they do not cause disease. Illness occurs when certain organ systems are weak and out of balance. When our bodies are in a weakened and unbalanced state, a hospitable environment is created for germs, bacteria and viruses to thrive which can lead to “catching” a cold or the flu. Acupuncture and Chinese medicine support and strengthen your body’s systems, especially your immune system. What’s more, acupuncture and Chinese medicine offer you a drug free, safe and natural way to effectively strengthen and support your body’s self-regulating, self-balancing and healing systems. And if you do get sick acupuncture can help you get back on your feet again, helping to stave off prolonged illness without the use of medication and over-the-counter drugs.